Description: In breeding plumage adult male wigeon has grey and white upperparts with a white patch on the upperwing. They have dark green speculums, bordered with black. Primary wing feathers are grey-brown. Their rumps are white and they have a black area surrounding the pale grey and white tail. Male wigeon have pinkish grey upperparts and upper breast, while their lower breast and belly are white. Their heads and necks are chestnut brown and they have a creamy coloured crown. They sometimes have a metallic green spot behind the eye. The bill is light blue with a black tip. Eyes are dark brown and legs and feet are dark grey. Out of breeding season, male wigeon have chestnut plumage with darker upperparts. Their flanks are rust coloured and the dark area around the tail has black feathers edged with white. Adult female wigeon can have grey or rust upperparts with a white belly. Her underwing is fawn with lighter markings and speculums are black. Her bill, legs and feet are blue-grey. Juvenile wigeon are similar to females with a mottled belly. Nesting: Wigeon build their nests on the ground near water, hidden under vegetation. It is lined with grass and a layer of down. Wigeon lay 8-9 white or creamy-white eggs which are incubated by the female alone for 24-25 days. Chicks leave the nest soon after hatching and remain with the female until they fledge at 40-45 days. Feeding: Wigeon eat aquatic plants such as leaves, stems, roots, algae and seeds. In the summer they will also eat insects. Where to see them: During winter large numbers of wigeon can be found by coasts all around the UK as well as anywhere where there is water. In the summer they can be found on breeding grounds in central and northern Scotland. Did you know? 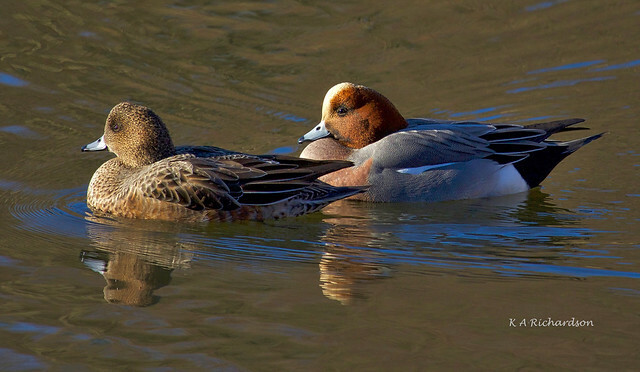 In the United States, Eurasian wigeon will form large flocks with American wigeon often hybridize.